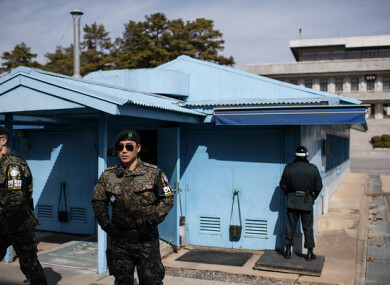 South Korean soldiers stand guard before the military demarcation line and North Korea's Panmun Hall, in the truce village of Panmunjom. THE UNITED STATES and South Korea kicked off a low-key joint military drill as a diplomatic thaw over North Korea gathered pace. Tension on the peninsula has showed signs of easing in recent months after the isolated, nuclear-armed North proposed summits with the South and their “imperialist enemy” the US. The annual Foal Eagle drill — a series of field training exercises involving some 11,500 American and 290,000 South Korean troops — began early this morning, Seoul’s defense ministry spokesman said. Kim is set to hold a summit with South Korean President Moon Jae-in on 27 April at the border truce village of Panmunjom — the third time ever that any leaders of the two rivals have met. Email “US and South Korea resume army drills as relations with Kim Jong-un's regime improve”. Feedback on “US and South Korea resume army drills as relations with Kim Jong-un's regime improve”.